Welcome to the Altenew November 2018 Stencil/Ink Spray Release Blog Hop + Giveaway, you should have arrived from Therese's blog. For this first project, i used the Flowing Buterfly stencil with the Cosmic Berry ink spray along with some Vicki Boutin Acrylic Gel to create the flying butterflies for this page. I chose to add some white ink spray, also from Altenew, to create the ombre effect of the butterflies on the page. 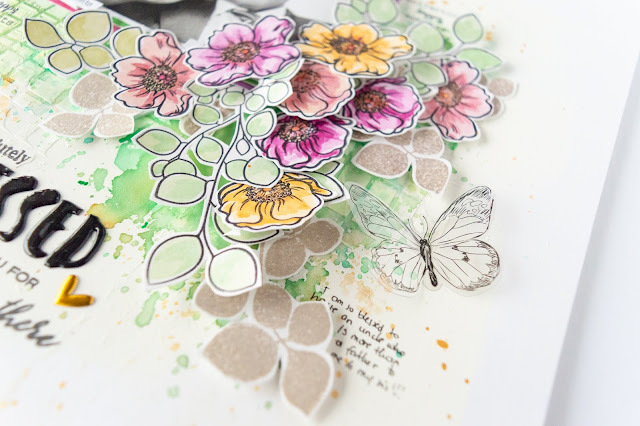 Love the ombre effect of the butterflies, the ink sprays are so easy to work with and can be used on so many projects with different results in each. Just like in the next project. For this card, i chose to use the Flower Mandala stencil and the Cosmic Berry Ink Spray to create the background of this card. First, I used a watercolor brush to apply the ink to a piece of heavy cardstock through the flower stencil, i made sure to mask the edges of the card so that they can frame the card. 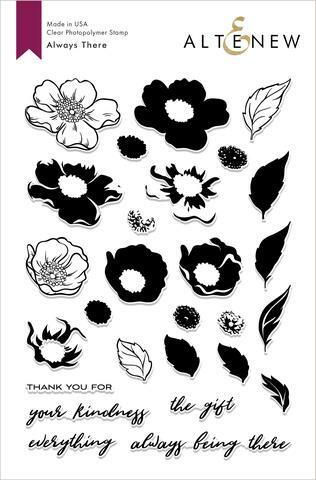 The inks were also used to color in the flowers images from the Always There stamp set that are layered with some leaves from the Leaf Canopy stamp set. 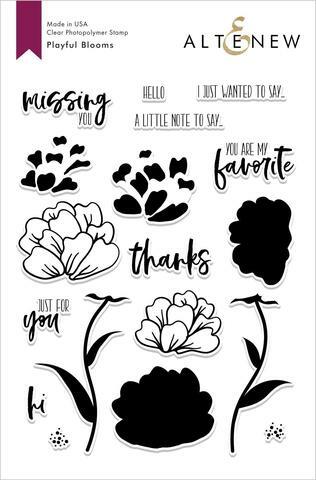 The sentiment comes from the PLayful Bloom stamp set. Just love the color combination, and all the layered details, and now this card was the inspiration for the last project. 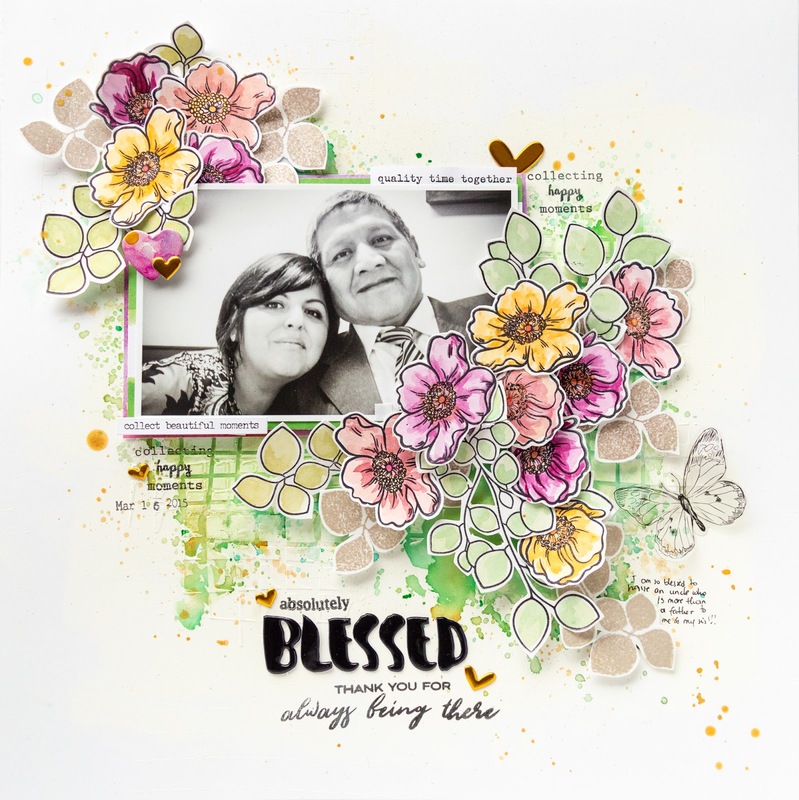 This layout features the Wavy Grid stencil and the Misty Mountain, Lagoon, Sunkissed and Cosmic Berry ink sprays in one page, as well as the Always There Stamp set, Leaf Canopy Stamp set, VIntage Rose stamp set, Collecting Memories stamp set. The color combination, texture and dimension of this page is just the perfect background for this beloved memory. 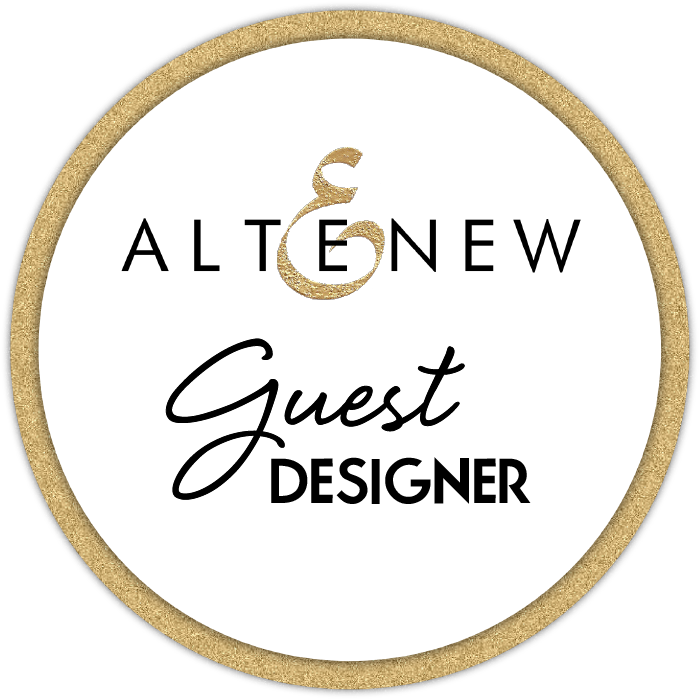 I hope you are all inspired to stop by the Altenew store to check all the new releases available, You will love each and every one of them! 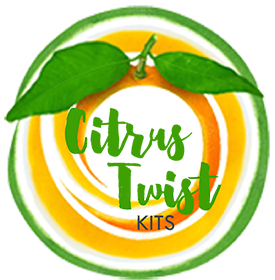 And now onto the sweetest part of the blog hop, the giveaways. To celebrate this release, Altenew is giving away a $50 gift certificate to 6 lucky winners! 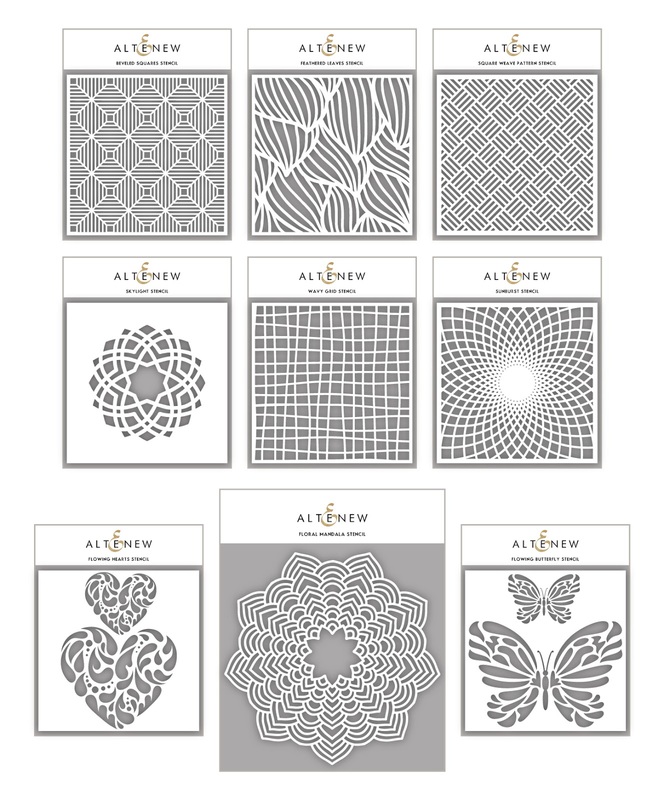 Please leave a comment on the Altenew Card Blog and/or Altenew Scrapbook Blog by12/3/2018 for a chance to win. 6 winners will be announced on the Altenew blogs on 12/7/2018. Thank you all for all the lovely comments, and i am sure you all would make beautiful art with the new release. Linda R you are the winner of the $30 Gift Certificate to the Altenew Store. 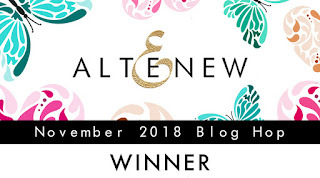 Please email winner@altenew.com by 12/15/2018 with the subject line Altenew November 2018 Stencil/Ink Spray Release Blog Hop Winner from Nathalie DeSousa's Blog. OMG! The card and the scrapbook layouts are GORGEOUS! I Love the stenciled butterflies!! Love your scrapbook layouts. Beautiful touches using the new stencils and sprays. Very pretty effects! So glad I found your blog! You did an amazing job! 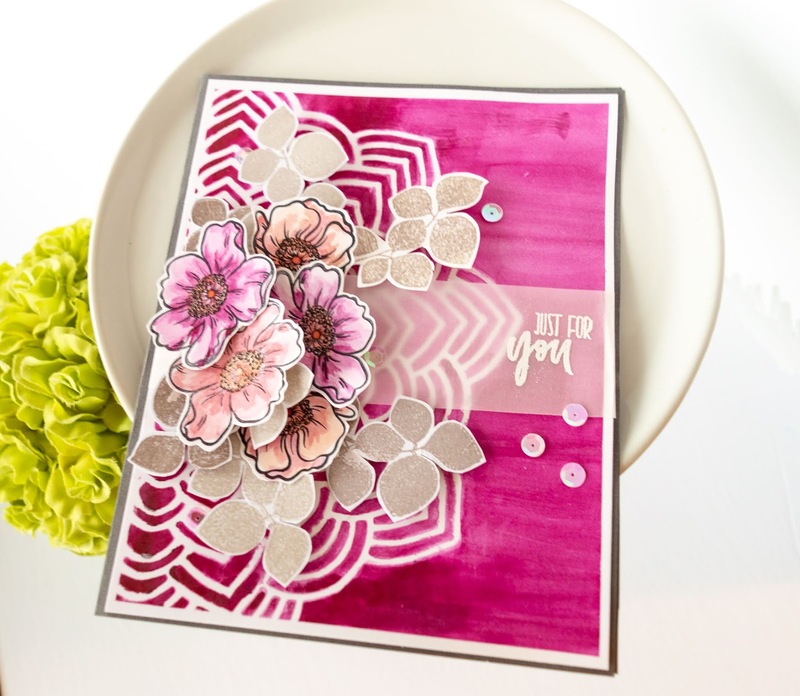 I like how you combined these new stencils and the beautiful inks with other stamp sets to create these gorgeous pages and the card. The dimension with those flowers make for beautiful pages! Thanks for the great videos. Thanks for sharing tgese gorgeous layouts. Beautiful projects! Love the bright pink! I love your designs! Those new stencils and sprays look like a lot of fun! I really love the way that mandala stencil looks peeking out behind florals! Love your card with the cosmic pink! Beautiful page layouts and vibrant card, lovely use of these awesome ink sprays and stencils. The inspiration is awesome! I really like the way you have used the Wavy Grid stencil. Love the new release, especially the Cosmic Berry ink spray. Lovely layouts! And that bright pink card is very pretty! Your layouts are absolutely gorgeous and your card is so pretty!! Gorgeous cards and layouts. Thanks for the chance. wow love your projects - the scrapbook pages are so creative!! Wonderful card and pages! Great techniques with the new stencils and love all the bright colors. Beautiful layouts and cards. Wonderful stencils and sprays. It is all so gorgeous! I really like you're scrapbook layout. wow. What amazing layouts! You did an excellent job putting the new stuff to work! I love your work! The butterflies are beautiful. Thank you so much for sharing your wonderful work. Your last project is my favorite. Thank you for sharing. The Wavy Grid stencil you've used on the pages sure gives a great distressed look. Great job. What beautiful creations! Love each one. Two wonderful projects! I especially loved the page layout! That background with the Wavy Lines stencil was fantastic! 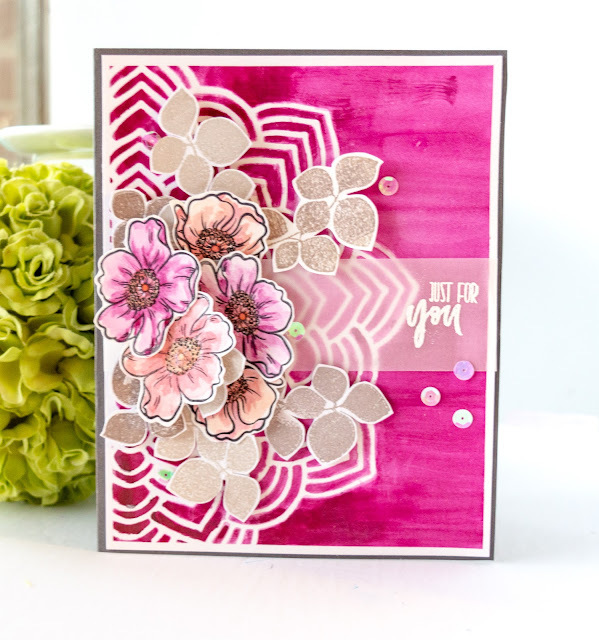 I loved the way you built up the layers with elements from various stamp kits. Beautiful! I just love your card and the ombre butterflies on your first layout. I love all the stamped flowers on the second layout. your own through the page is gorgeous. I really loved your layout! From the color palette to the stencil used,to how you arranged the florals and the leaves! I loved everyone of your layouts! Love all your projects! You are very talented! I love that wavy grid stencil! I adore your gorgeous creation! Wonderful projects! The new stencils make such lovely backgrounds for each design. The wavy grid is one of my favorites, but the way the mandela sets off the flowers makes me want that one, too. Gorgeous projects! I love these new stencils. Thanks for sharing your video. Gorgeous card and layouts! I love the stencils from this release and the beautiful way you have used them ! 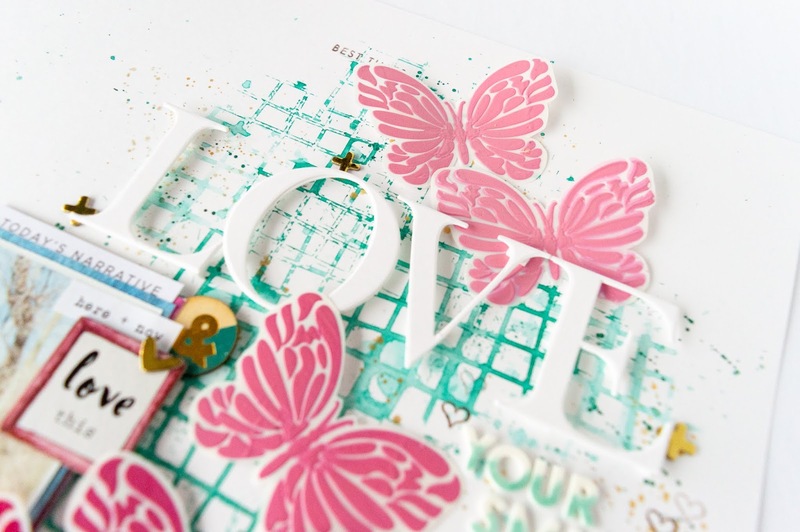 Stencils are great on cards but they really shine on scrap pages and this page is fantastic. WOW - you use on of the stencil on the LO is really amazing. Great way to use stencils wow. Great spray ink colours too. Thanks for sharing your cards. Amazing layouts! I love the creative way you used the stencils to make butterflies and to stamp! Great ideas! The butterflies are so pretty. I love the card with the flowers also. Thanks for being a part odof tblog roll. WoW! These are all so beautiful! I can't even begin to choose a favourite. You've done it again Altenew. And these projects are all simply beautiful! Love your beautiful layouts and card. Thank you for sharing!!!! Wow, these are all so gorgeous, you're one talented and inspirational lady! I can't even pick a favourite! Beautiful card and layouts! Love the background and butterflies of the first layout! Thanks for the video. Very pretty stenciled projects. Love all the butterflies on the first one. Wonderful effects, and I love all of the flowers. Pretty card and beautiful layout. 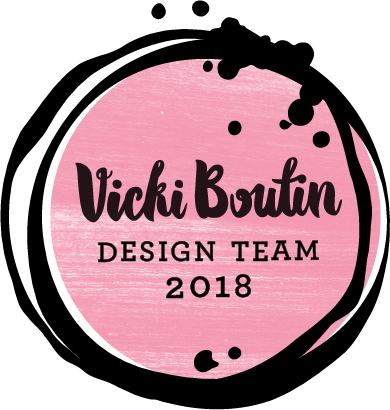 Your designs are so vibrant! Gorgeous pink Floral Mandala card! Your layouts are so pretty but I am just in love with your pink card. I love the background and the layers. The layouts are so nice but that card is spectacular!! I love love love it!! Very beautiful card and layouts. And thanks so much for the video. It really gives me a great idea how to use these new products. Love this release and your use to the butterflies is wonderful. They are so pretty! HI, You are the winner of this month's $30 Gift Certificate to Altenew. 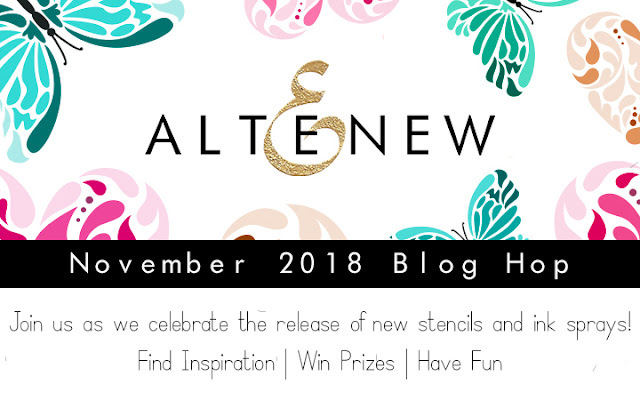 PLease email winner@altenew.com by Dec. 15/2018 with the subject line Altenew November 2018 Stencil/Ink Spray Release Blog Hop Winner from Nathalie DeSousa's Blog. Thanks so very, very much. I am honored and grateful. I did email Altenew. 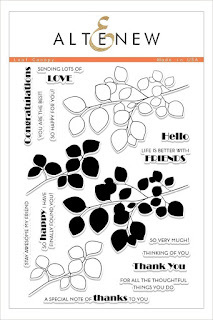 Your projects using the new stencils are wonderful! Beautiful projects! I love the way you masked the edges of the card to leave that little bit of border to frame it! You say super simple-I say super Wow! These are all beautiful! I love what you did with the stencils. That Cosmic Berry ink is so bright and vibrant- I love it. Thanks for the videos. I really enjoyed watching the layouts come together. I am loving your projects, especially the layout - I love how you used the wavy grid stencil for the background! Looks amazing! Such pretty cards. I love the Flowing Butterfly Stencil! They’re all so nice I can’t pick a favourite. Thank you for sharing! Beautiful cards. I love the colors and the layouts. These new stencils and ink sprays are amazing. What gorgeous layouts and cards. All of your ideas are just lovely: the flight of ombre butterflies, the metallic leaves behind your flowers, and your general compositions. One can tell that you love mixed media, and you do it so well. Thanks for sharing with us! great techniques in your video and beautiful creations! The “Just for You” card...Wow, just WOW! I love pink, and that Mandala background. Beautiful card, thanks for sharing it with us! Wonderful and inspiring projects! Loving the stencils! I think your cards are beautiful I love the butterfly's. By the way, Merry Christmas and I hope everyone has a lovely holiday! I just love all of your creations! Everything you make is so unique! 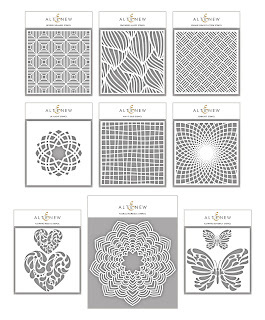 I am loving these new sprays, stencils and stamps by Altenew! Great company!! Wonderful art. 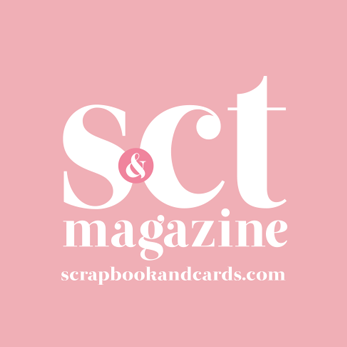 Your card is very vibrant & eye catching, those scrap book layouts are fabulous, lots going on to get you closely looking, pretty colours & well set out. This use of the stencils are very creative. Very cool layout! Your layouts and card are gorgeous. Thanks for sharing your tips and the technique video. The wavy grid is my favourite too! Absolutely lovely layout! Beautiful creations! I especially like the Flower Mandala stencil and the Cosmic Berry Ink Spray, it is stunning. Thank you for sharing and for the awesome inspiration.